First, the deadly flu and the new and alarming numbers coming in from the CDC tonight. Among the worst flu season in a decade, and it hasn’t peaked yet. 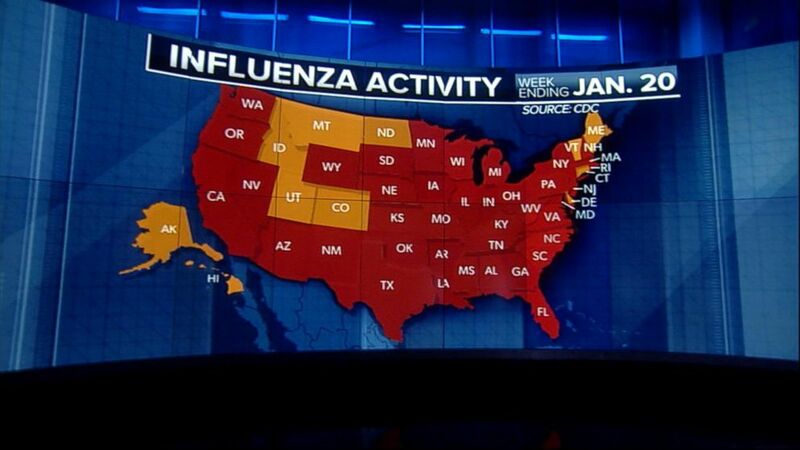 39 states reporting high flu activity, and seven more children lost last week alone. 37 children dying so far this season, but tonight another age group making news because of how hard this is hitting this year, baby boomers, and what about the caretakers? If you are caring for someone with the flu, should you get tap flew as well? Here’s ABC’s Linzie Janis tonight. Reporter: Tonight, 37-year-old mother Karlie illg Slaven from Indiana, one of the flu epidemic’s latest victims. Her father says she’d been taking care of her husband and children who had the virus when she started feeling sick. My wife called and said, “Get over here right away. They put her in the icu. She’s in critical condition.” Reporter: He says she died, just three days after testing positive for the flu. We all were there, standing around her, and she left us about 6:30 in the morning. Reporter: Karlie’s story, highlighting the danger to caregivers and others at home. Tonight, the CDC recommending that some people at a higher risk take a preventative dose of Tamiflu, even if they don’t have the flu. A step that could cut their chances of getting the virus by up to an estimated 80%. If there are infections in the household, and you are concerned about an older individual in the home, talk – with your doctor and see if prophylactic medicines are something that would be useful. Reporter: Across the country, nearly 12,000 flu patients so sick they’ve had to be hospitalized. The CDC says the number of charn reported to have died from the flu this season has been climbed to 37. 12-year-old Dylan winnik’s family say he had a fever on Monday and died on Tuesday. Shocking. You get a call that he’s passed. How the hell does that happen?” Reporter: David, something unique this year. The CDC says hospitalization rates for people between the ages of 50 and 64 are higher than for the very young. It’s usually the other way around. The hardest hit group of people, still those 65 and older, David. All right, so seniors, children and this year, the baby boomers too. Linzie, our thanks to you. About that point you heard from Linzie there, caretakers, caring for loved ones with the flu. Should they be taking tap flew as well? Let’s dig into this with Jen Ashton. I know your daughter has the flu at home. We wish her a speedy recovery along with everybody. You said you were on this, and you said it’s easier for you to get, but people should consider this to get. I treat pregnant women, but groups that should kor it as a prophylactic measure to reduce the risk of getting sick with high contact, that includes people over the age of 65, anyone with asthma, pregnant women or anyone with a weakened immune system. Those are the vulnerable groups. In the meantime, we heard you have to be on it within 4 hours of symptoms. You have learned something else now. That was the old thinking, and there was the old line in the sand, and there is new data that suggests that even after the first 48 hours of symptoms, anti-viral medications can be helpful, so that should not be a reason to withhold treatment. Dr. Ashton with us.